While river transport of carbon to the ocean is not on a scale that will bail humans out of our CO2 problem, we don’t actually know how much carbon the world’s rivers routinely flush into the ocean – an important piece of the global carbon cycle. But in a study published May 14 in the journal Nature, scientists from Woods Hole Oceanographic Institution (WHOI) calculated the first direct estimate of how much and in what form organic carbon is exported to the ocean by rivers. The estimate will help modelers predict how the carbon export from global rivers may shift as Earth’s climate changes. The scientists, who included Bernhard Peucker-Ehrenbrink, and Timothy Eglinton (now at ETH Zürich), amassed data on sediments flowing out of 43 river systems all over the world, which cumulatively account for 20 percent of the total sediments discharged by rivers. The representative rivers also encompassed a broad range of climates, vegetation, geological conditions, and levels of disturbance by people. From these river sediment flow measurements, the research team calculated amounts of particles of carbon-containing plant and rock debris that each river exported. They estimated that the world’s rivers annually transport 200 megatons (200 million tons) of carbon to the ocean. The total equals about .02 percent of the total mass of carbon in the atmosphere. That may not seem like a lot, but over 1000 to 10,000 years, it continues to add up to significant amounts of carbon (20 and 200 percent) extracted from the atmosphere. Generally, plants convert CO2 from the atmosphere into organic carbon via photosynthesis. But most of this carbon eventually returns to the atmosphere when plant material (or animals that eat plants) decompose. A small fraction of this material, however, ends up in rivers. They carry it out to sea, where some settles to the seafloor and is buried and disconnected from the atmosphere for millions of years and eventually makes its way back to the surface in the form of rocks. At the same time, rivers also erode carbon-containing rocks into particles carried downstream. The process exposes carbon to air, oxidizing the previously locked-up carbon into carbon dioxide that can leak back out to the atmosphere. 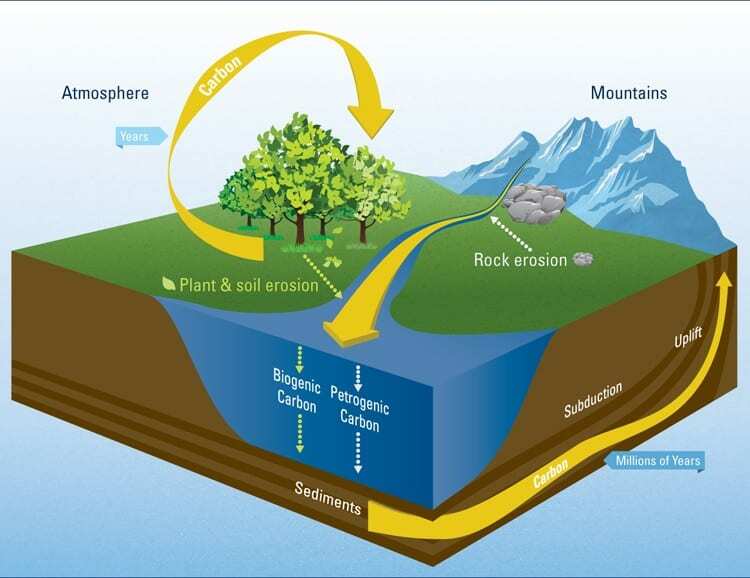 Until now, scientists had no way to distinguish how much of the carbon whisked away by rivers comes from either the biospheric or petrogenic (rock) sources. Without this information, scientists’ ability to model or quantitatively predict carbon sequestration under different scenarios was limited. To solve this dilemma, the scientists found a novel way to distinguish for the first time the sources of that carbon—either from eroded rocks or from decomposed plant and soil material. They analyzed the amounts of carbon-14, a radioactive isotope, in the river particles. Carbon-14 decays away within about 60,000 years, so it is present only in material that came from living things, and not rocks. Subtracting the portion of particles that did not contain carbon-14, the scientists calculated the percentage that was derived from the terrestrial biosphere: about 80 percent. But even though biospheric carbon is the major source of carbon exported by rivers, the scientists also discovered that rivers surrounded by greater amounts of vegetation didn’t necessarily transport more carbon to the ocean. Instead, the export was “primarily controlled by the capacity of rivers to mobilize and transport” particles. Erosion is the key factor—the more erosion occurs along the river, the more carbon it transfers to sea and sequesters from the air. The new study gives scientists a firmer handle on measuring the important, and heretofore elusive, role of global rivers in the planetary carbon cycle and enhances their ability to predict how riverine carbon export may shift as Earth’s climate changes. 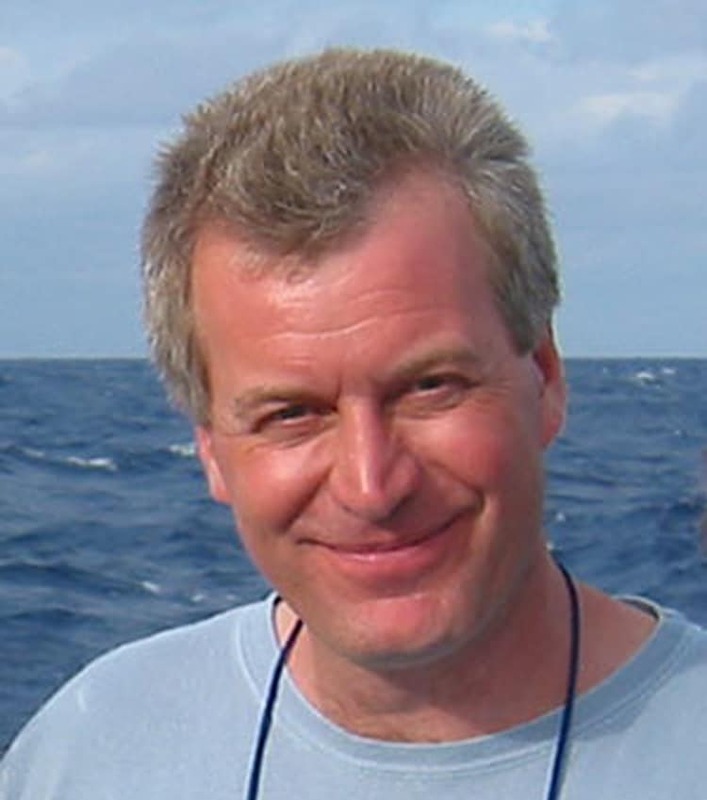 “This study will provide geochemical modelers with new insights on an important link between the global carbon and water cycles,” says Don Rice, program director in the National Science Foundation’s Division of Ocean Sciences, a major funder of the research. The research was also supported by the Swiss National Science Foundation. Lead author, Valier Galy, and his colleagues found a novel way to distinguish for the first time the sources of organic carbon whisked away by rivers to the ocean. To determine if the carbon came from biospheric (plants and soil) or petrogenic (rock) sources, they analyzed the amounts of carbon-14, a radioactive isotope, in the river particles. Carbon-14 decays away within about 60,000 years, so it is not present in rocks. The new information will help scientists quantitatively predict carbon sequestration under different scenarios. WHOI senior scientist Bernhard Peucker-Ehrenbrink investigates the cycling of elements and their isotopes between major geochemical reservoirs (continental crust, oceanic crust, seawater, the Earth's mantle) in order to understand the chemical evolution of Earth. 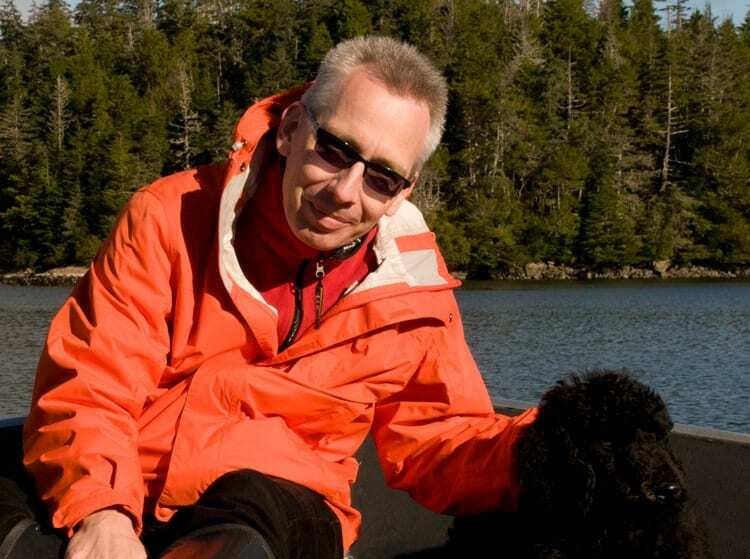 Since 2008 he has been working with colleagues to build a network of global rivers observatories to observe how environmental change and societal pressures affect the biogeochemistries of river basins over the coming decades. 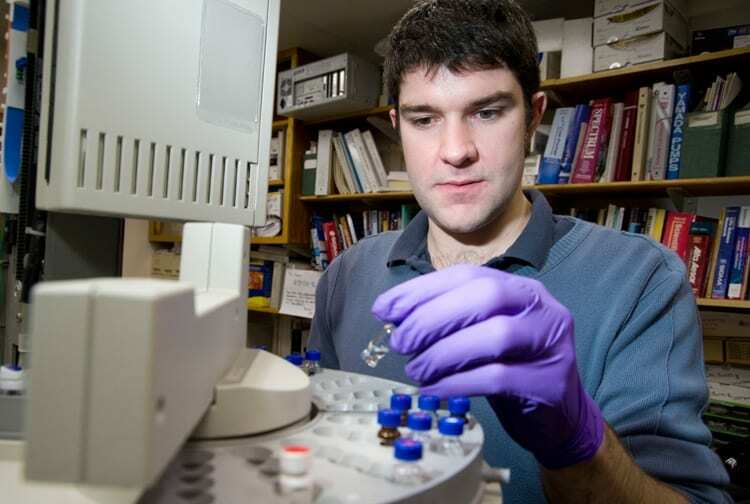 Tim Eglinton uses radiocarbon (C-14) to date organic molecules, carefully isolating and determining ages of minute amounts of individual organic compounds from ocean sediments and particles. An Now a WHOI adjunct scientist, Eglinton has been a professor of Biogeoscience within the Geological Institute at ETH Zürich since 2010.